Smiles are infectious. The video explains how a smile can change the moods of both the smile-er and the smile-ee. The smile-receiver is instantly put at ease while the smile-giver’s endorphins get a boost. It’s a win-win! Most important to a professional healthcare applicant interview, demonstrating emotional intelligence is a primary objective. Your “opening smile” shows that you are comfortable with human interaction and helps display emotional intelligence. Also, that confident smile indicates that you are anticipating a relaxed and favorable outcome to the interview encounter. A word to the wise: no faking the smile! It has to be authentic. Practice in the mirror or on camera, observing at various angles, to help you understand how you will express the all-important smile. Initial eye contact is very important. When you meet with the faculty who will conduct the interview, there will be one who initiates the greeting. Smile, shake hands firmly, and make eye contact. This is the important part: hold the eye contact just long enough to let him or her break it. If you break it eye contact first, it shows lack of confidence on your part. It’s like the etiquette of a phone call where the person who initiated the call also has the responsibility to decide when the call should finish. Implied is that I am advising you to be the purveyor, the controller, of that initial eye contact and hold it until you are ready to disengage—it is in this way that you will establish yourself as confident and appropriately commanding. I think I might be giving dating advice here, but I digress…. This advice comes right from the top: Dr. Voorhees, VP of Student Affairs, puts great stock in a person’s handshake. It’s one of the first things she’ll report to me about an interviewing applicant if they did, indeed, make a good first impression with a practiced and firm handshake. It’s important, so practice the the firm handshake until you’re comfortable with it. Women: You don’t want this to happen! 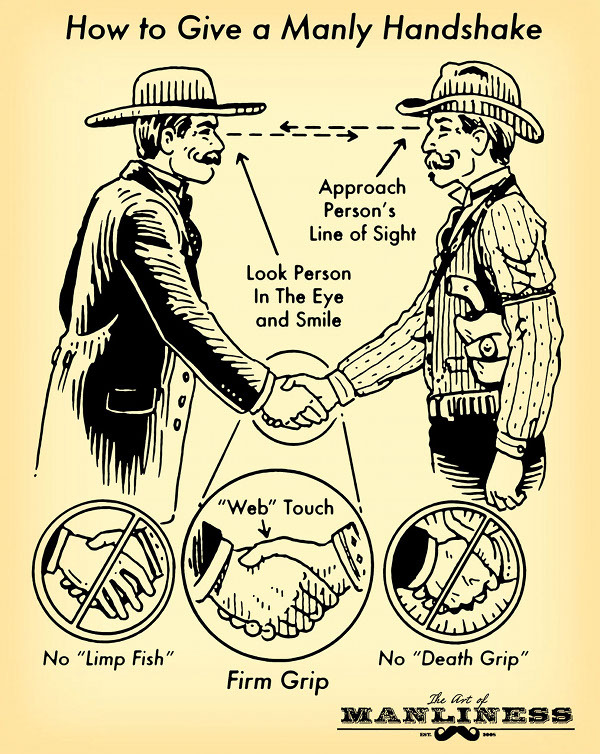 To initiate the handshake, open your hand, turn it sideways, and project your fingers forward. Don’t offer it palm down or it will seem like you want it kissed, not shaken! Women are only just learning how to perform this skill. I will acknowledge on the behalf of all women out there, it may seem weird to shake another woman’s hand, but I advise that you get used to it. For everyone, and especially women, palms should go “web-to-web” before you squeeze with moderate pressure. The web is the anatomical area between the thumb and the index finger for those who didn’t get that information in anatomy class. I just tried to Google a photo of the web of the hand to show you where that is but couldn’t find a usable photo—I digress, but apparently, that’s one weird place to have a body piercing—yikes! Also for the women: Make sure you don’t offer up the tips of your fingers for a handshake. When you do this, it’s not clear whether you expect to shake hands or you want the back of your hand kissed. Your hand should be turned sideways, fingers pointed out—with bravado. Don’t offer your little birdie-like-hand with the back facing up because if someone takes ahold of it to shake it, it feels like holding a dead parakeet! After you go web to web with the engagement, apply firm pressure but not too much. Dr. Voorhees often reports how nervous applicants, especially men, squeeze too hard. But do apply moderate pressure because that is what finishes up the firm handshake. Three pumps of the handshake and then let go. It’s a common mistake to continue shaking while you are exchanging greetings, which gets awkward should someone want to let go. You do need to pump with the shake otherwise it’s weird—it defaults to feeling more like holding hands than shaking hands. The reverse logic applies with the handshake: you wait for the more senior person, the person who initiated the shake, to break it. Sometimes it may not last all the way through three pumps. If you have cold hands, try to warm them up before you shake hands. If you have sweaty hands, do the best you can to wipe them with a tissue or handkerchief (an old school device, but works well in this situation). We know that some people have inherently sweaty palms no matter what they do so don’t develop a complex should you be in possession of this condition. Have your right hand free for the handshake whenever you are anticipating one. That would be anytime you are waiting, during the various stages of the interview process, for your name to be called or a door to open. You will look like an awkward juggler if you shift items, a portfolio or a purse, to the other hand and delay the offered handshake. 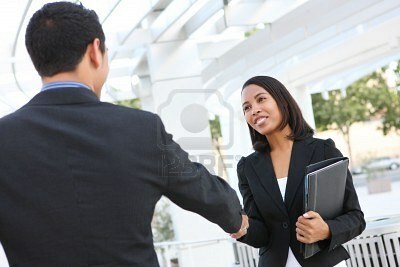 Practice shaking hands with someone who is accustomed to encounters in business settings. Ask them to give you pointers if they think your handshake could be more effective. This is especially true for women. I’m not making too big of a deal out of this—trust me. This is gold, pure gold! Do these three basic things and you’ll boost your interview outcome exponentially. Tagged as: getting into optometry school, optometry admissions, optometry interview, optometry interview tips, optometry school admissions, scco.